No further actions has been taken against the members. 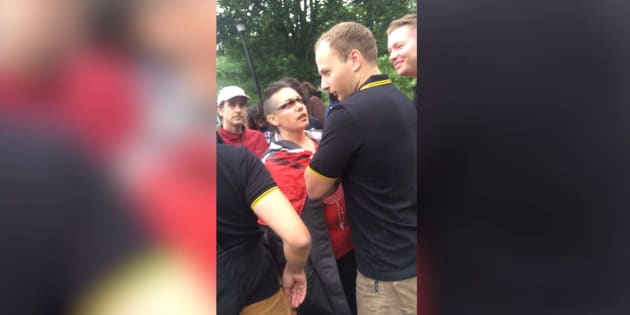 HALIFAX — No criminal charges will be laid against five so-called "Proud Boys'' who disrupted a Mi'kmaq ceremony in downtown Halifax on Canada Day, the Royal Canadian Navy says. Rear-Admiral John Newton said Thursday that an investigation has wrapped up with no further actions taken against the members, although they remain on probation and must adhere to unspecified conditions. "If they fail, they are gone. This is not lightweight punishment,'' he told reporters. The servicemen had been relieved of their duties and re-assigned to other jobs, pending the results of the military police investigation into the incident at a statue of Halifax's controversial founder, Edward Cornwallis. "They have to actually pass this probationary period to get back onto their full career progress,'' he said. "I'm not going to spell out the individual type of probationary measures because there is privacy and confidentiality of the members involved and they have that right as individual citizens,'' said Newton. The investigation began in early July, a few days after a group of "Proud Boys'' confronted Indigenous people gathered in a park for what they described as a sacred rite. The incident was caught on videotape and spread on social media. Rebecca Thomas, who was at the Canada Day ceremony, said she was disappointed at the "lack of consequences'' for the service members who were involved in the incident. "I would have liked to have seen a restorative justice process for these individuals where they have to face the community that they wronged,'' said Thomas, who is Mi'kmaq and Halifax's poet laureate. Thomas wonders whether the punishment would have been as lenient had the service members interrupted a Roman Catholic mass or a Remembrance Day ceremony. The Armed Forces apologized for their actions. Defence Minister Harjit Sajjan and Gen. Jonathan Vance, chief of the defence staff, both condemned the actions of the men. The "Proud Boys'' — known for matching black polo shirts often worn by members — was founded in the U.S. by Gavin McInnes, a Canadian who helped establish Vice Media and is now an outspoken, right-wing political pundit. A municipal employee covers the statue of Halifax founder Edward Cornwallis, who issued a bounty on the heads of indigenous people, during a protest in Halifax on July 15, 2017. A Facebook post from the Proud Boys Canadian Chapters Thursday struck a triumphal and defiant tone in reaction to the navy's actions. He said reporters don't know the servicemen's version of the story, but "it means nothing'' anyway, because what matters is what the public perceives. Newton said he has dealt with many navy mishaps caused by personal mistakes, and although the servicemen embarrassed the military, the matter has been dealt with through the governing policies and procedures. "You cannot just turn around and fire everybody. They have rights,'' he said. Thursday was Newton's last full day as commander of Canada's East Coast navy, as he begins work with Veterans Affairs Canada in Charlottetown. Rear Admiral Craig Baines will assume command in Halifax in a ceremony Friday morning. In a statement Thursday, the military said the Halifax incident has provided a leadership opportunity for military brass — and the best way to confront and defeat intolerance is through education and training. "Any action by a Canadian Armed Forces member (in uniform or not) that demonstrates intolerance or shows disrespect towards the people and cultures we value in Canada is completely unacceptable,'' it said. "The Canadian Armed Forces celebrates the contributions that First Nations, Inuit and Metis people have made to Canada and its military. It said the Armed Forces view diversity as a source of strength and flexibility.